One of the most confusing sentences you’ll read in an introduction to quantum mechanics – not only in those simple (math-free) popular books but also in Feynman’s Lecture introducing the topic – is that we cannot define a unique wavelength for a short wave train. 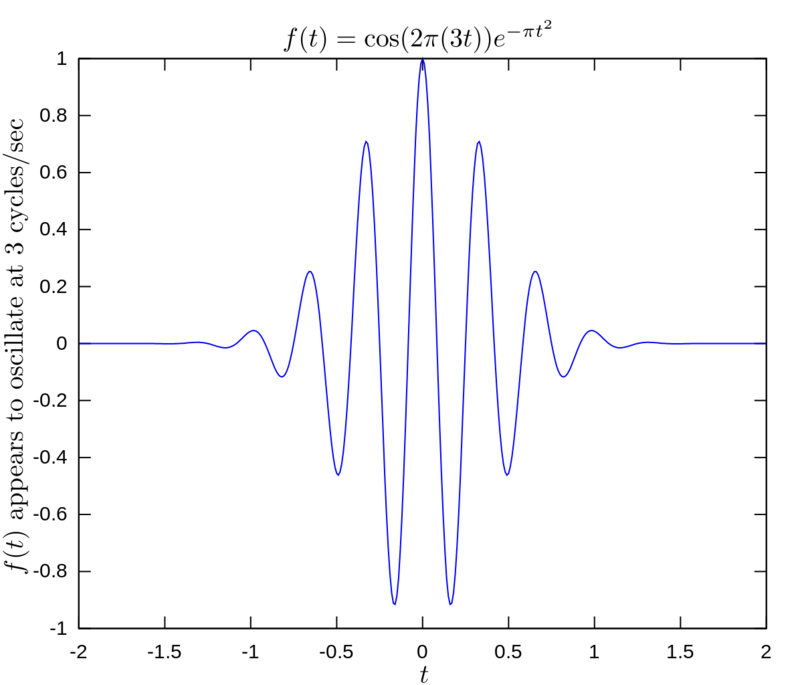 In Feynman’s words: “Such a wave train does not have a definite wavelength; there is an indefiniteness in the wave number that is related to the finite length of the train, and thus there is an indefiniteness in the momentum.” (Feynman’s Lectures, Vol. I, Ch. 38, section 1). That is not only confusing but, in some way, actually wrong. In fact, this is an oft-occurring statement which has effectively hampered my own understanding of quantum mechanics for a long time, and it was only when I had a closer look at what a Fourier analysis really is that I understood what Feynman, and others, wanted to say. In short, it’s a classic example of where a ‘simple’ account of things can lead you astray. The first factor in the product is a cosine function: cos[2π(3t)] to be precise. The second factor is an exponential function: exp(–πt2). The frequency of this ‘product function’ is quite precise: cos[2π(3t)] = cos[6πt] = cos[6π(t + 1/3)] for all values t, and so its period is equal to 1/3. [If f(x) is a function with period P, then f(ax+b), where a is a positive constant, is periodic with period P/a.] The only thing that the second factor, i.e. exp(–πt2), does is to shape this cosine function into a nice wave train, as it quickly tends to zero on both sides of the t = 0 point. So that second function is a nice simple bell curve (just plot the graph with a graph plotter) and it doesn’t change the period (or frequency) of the product. 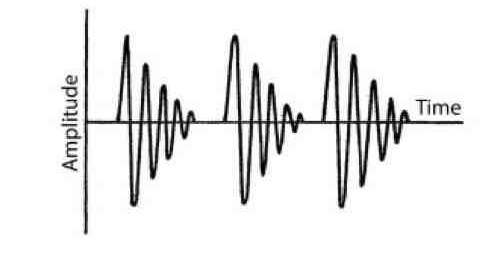 In short, the oscillation below–which we should imagine as the representation of ‘something’ traveling through space–has a very definite frequency. So what’s Feynman saying above? There’s no Δf or Δλ here, is there? The point to note is that these Δ concepts – Δf, Δλ, and so on – actually have very precise mathematical definitions, as one would expect in physics: they usually refer to the standard deviation of the distribution of a variable around the mean. […] OK, you’ll say. So what? Well… That f(t) function above can – and, more importantly, should – be written as the sum of a potentially infinite number of waves in order to make sense of the Δf and Δλ factors in those uncertainty relations. Each of these component waves has a very specific frequency indeed, and each one of them makes its own contribution to the resultant wave. Hence, there is a distribution function for these frequencies, and so that is what Δf refers to. In other words, unlike what you’d think when taking a quick look at that graph above, Δf is not zero. So what is it then? So what do we see here? The first thing you should note is that the value of both the real and imaginary part of the integrand quickly tends to zero on both sides of the t = 0 point. That’s because of the shape of f(t), which does exactly the same. However, in-between those ‘zero or close-to-zero values’, the integrand does take on very specific non-zero values. As for the real part of the integrand, which is denoted by Re[e−2πi(3t)f(t)], we see that’s always positive, with a peak value equal to one at t = 0. 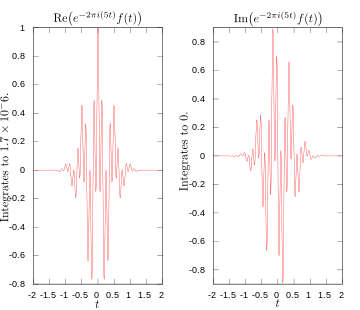 Indeed, the real part of the integrand is always positive because f(t) and the real part of e−2πi(3t) oscillate at the same rate. Hence, when f(t) is positive, so is the real part of e−2πi(3t), and when f(t) is negative, so is the real part of e−2πi(3t). However, the story is obviously different for the imaginary part of the integrand, denoted by Im[e−2πi(3t)f(t)]. That’s because, in general, eiθ = cosθ + isinθ and the sine and cosine function are essentially the same functions except for a phase difference of π/2 (remember: sin(θ+π/2) = cosθ). In short, what we have here is a very significant contribution (the associated density is 0.5) of the frequency ν = 3. Indeed, let’s compare it to the contribution of the wave with frequency ν = 5. For ν = 5, we get, once again, a value of zero when integrating the imaginary part of the integral above, because the positive and negative values cancel out. As for the real part, we’d think they would do the same if we look at the graph below, but they don’t: the integral does yield, in fact, a very tiny positive value: 1.7×10–6 (so we’re talking 1.7 millionths here). That means that the contribution of the component wave with frequency ν = 5 is close to nil but… Well… It’s not nil: we have some contribution here (i.e. some density in other words). So what? You’re probably tired by now, and wondering what I want to get at. Well… Nothing much. I’ve done what I wanted to do. 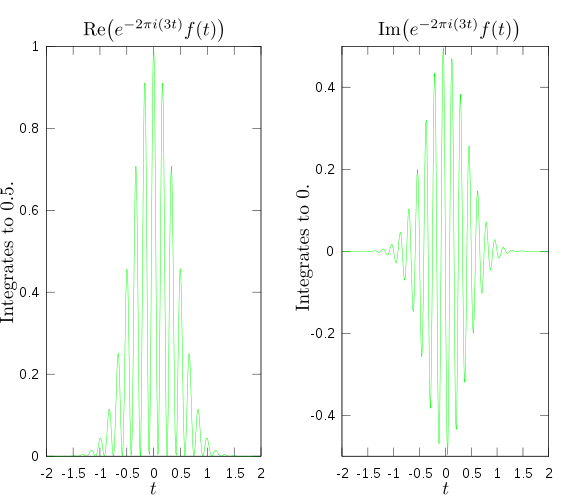 I started with a real-valued wave train (think of a transient electric field working its way through space, for example), and I then showed how such wave train can (and should) be analyzed as consisting of an infinite number of complex-valued component waves, which each make their own contribution to the combined wave (which consists of the sum of all component waves) and, hence, can be represented by a graph like the one above, i.e. 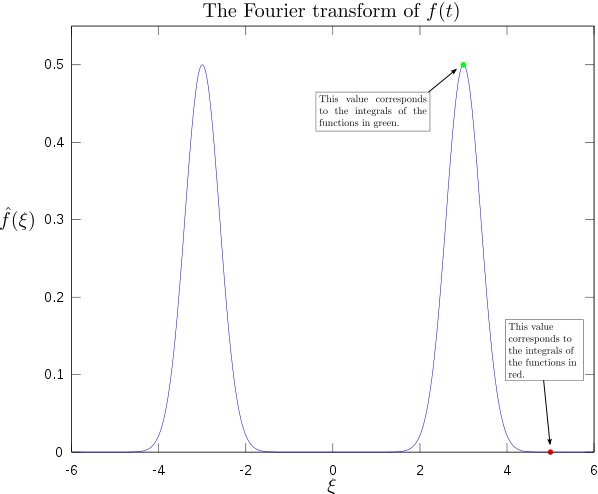 a real-valued density function around some mean, usually denoted by μ, and with some standard deviation, usually denoted by σ. So now I hope that, when you think of Δf or Δλ in the context of a so-called ‘probability wave’ (i.e. a de Broglie wave), then you’ll think of all this machinery behind. This entry was posted in Physics and tagged complex Fourier analysis, de Broglie wave train, Fourier analysis, wave trains. Bookmark the permalink.